COFFEE INFO SESSION: Join us for coffee and light snacks while we discuss our group’s vision. Water Brings Life, in association with Living Water International, is launching an initiative to bring together area churches who are passionate about addressing the world water crisis. This is not a request for money; instead, we want to help and encourage you if your church is already involved with world water issues or you would like some easy ways to impact the world water crisis within your existing international/missions ministries. We envision the Triangle Water Alliance to be a group that provides ideas, resources, and networking opportunities to faith organizations who want to make an impact in the lives of those who lack the basic necessity of clean water. Join us on May 12 from 11:00 a.m. to Noon at Evergreen Community Church in Raleigh for an information session. Coffee and light snacks will be served. If you have questions, please contact Alicia Hemphill at alicia.hemphill@gmail.com. This went out to all the area churches I could find. If you didn’t get it and would like to attend, either e-mail me or just show up. We’d love to have you! Hi gang! Sorry for the long absence. I was laid up by a chronic medical issue that decided to become acute for over a month. But, I’m back! I will try to get responses to everyone who has commented and e-mailed by this weekend. Rock on! The average new drinking water well in Africa serves about 1000 people. Once the well is in place, people in the community stop dying. More people move into the community because they have water. The villages grow. But, in Liberia (and elsewhere), war makes the wells easy targets of terrorism and violence. An even larger community is now left with polluted water to drink. Disease speads even more quickly. More people begin dying and watching their children die. December 21 – We planned to collect the money through December 28 and send the check by Jan. 1. Total giving thus far for the Water Project is $6500, and donations are still coming in. $6500 from our little church. With the economy in the toilet, several people in our community having lost their jobs or knowing it’s imminent…and in 2 weeks they gave over twice what we thought we’d see in a month. Now, we’ll be able to repair two wells, maybe even three if a little more money comes in. Our little community of about 100 people on a Sunday is going to impact thousands of people across the globe. Happy Birthday, Jesus. Some of Your folks are pretty awesome. So, I’ve noticed that “World Water Day 2009” is far and away the most common search that brings people (you all) to this blog. The second most common search that brings you here is “Oprah.” It finally occured to me to let you know what my BIG FAT SCARY goal for World Water Day 2009 is. Here, let me give you a hint. How does Oprah Winfrey do it? And why does no one else — TV pundit, critic, or retailer — have anything like her influence among book readers? On Sept. 22, Winfrey announced that the next pick for her television book club would be James Frey’s A Million Little Pieces, a memoir of alcohol, drug addiction, and detoxification. Within four days, club aficionados bought 85,000 copies, reckons publisher Anchor Books. An additional 615,000 books bearing the Oprah’s Book Club seal await purchasers at stores. …Perhaps the most astonishing aspect of the Oprah phenomenon is how outsized her power is compared with that of other market movers. Some observers suggest that Jon Stewart of Comedy Central’s The Daily Show could be No. 2. Other proven arm-twisters include Fox News’s Sean Hannity, National Public Radio’s Terry Gross, radio personality Don Imus, and CBS’ 60 Minutes. But no one comes close to Oprah’s clout: Publishers estimate that her power to sell a book is anywhere from 20 to 100 times that of any other media personality. 85,ooo copies of a book sold in 4 days. Let’s just estimate that meant $20/book. That’s $1.7 million…in four days. 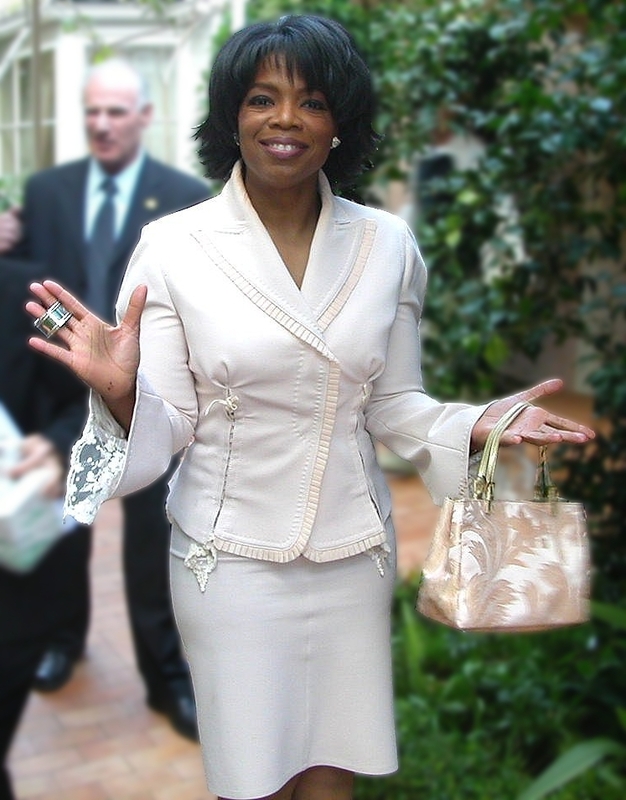 What do you think would happen if Oprah did a 5 minute segment on the world water crisis on Friday, March 20, 2009…the Friday before World Water Day (March 22) 2009? What if she challenged her viewers to donate money to a water aid organization like Living Water International or The Water Project? I wonder if Oprah’s viewers could single handedly provide safe drinking water and sanitation for an entire African nation? Wouldn’t that be awesome?! Ideas? Comments? What do you think? Water Partners International has designated today, World Toilet Day 2008. If you’re looking for a fun and easy way to make a difference in the world water crisis…here’s your chance. Sponsor a toilet today. Water Partners can provide a toilet (or adequate sanitation situations) for 1 person for $30. Celebrate with your friends and family today! Some of you have certainly heard about Starbucks getting spanked by the press because of their policy regarding water use in their stores. Here is a link to a news article. The gist is, Starbucks has a policy of leaving the tap running in the dipper well, the place they clean the spoons used for stirring the drinks they make. This wastes millions of gallons of water each day. I called our local Starbucks, in Raleigh, NC, and they confirmed that they do, in fact, keep the water running all day, every day. The employees have been forbidden to turn the water off for any length of time during business hours. This includes the entire time Raleigh was under severe water restrictions due to a significant drought this summer. While we, good citizens that we are, put milk jugs in our toilet tanks, let the “yellow” mellow, watched our lawns turn a crispy brown color, collected shower water (before it warmed up) in buckets to facilitate flushing and watering indoor plants…Starbucks merrily wasted enough water each day to solve the water crisis in Namibia. I thought about using this blog to organize a protest or a boycott. But, then I thought some more. The fact is, Starbucks is losing money as the water goes down the drain. As a result of the bad press, they are actively looking for better ways to sterilize their utensils. And, as a company, they have taken an interest in becoming more environmentally responsible. You can read about what they do and why, here. As it turns out, Starbucks has a social networking section on their site. I signed up today as part of that community. There is a section there where social justice minded folks can start “Actions”, which are basically challenges for the community to participate in some sort of social justice action. I set up an Action on their site today. My challenge was this. What is each of us bought 1 less Christmas present and donated the money we would have spent to a water aid organization? Wouldn’t that make Christmas seem more significant this year? I asked people to post how much they donate and to which organization on the site. See, I figured we could either fuss at Starbucks or we could urge them on in the right direction. Currently, they are adding to the world water crisis…but, if they keep moving in the direction they’re moving in right now, they might become a significant agent for change. If they see people getting excited about solving the global water crisis, then, business-wise, it’s going to make sense for them to get on board. So…will you join the Starbucks community and, specifically, join my Action? Here’s a link. Join today and make your voice heard! Water is mentioned in the first chapter of Genesis, the last chapter of Revelation and several hundred times throughout Scripture. Water is often used in scripture to communicate God’s character and provision for all creation and for every living creature. Without water, there is no life—spiritually or physically. As you engage in strategic intercession for the water needs of the world, the following guidelines may be a helpful focus for your prayer. Worship – Effective prayer begins when we worship the Lord Jesus in Spirit and in Truth. True worship enables us to walk in purity and holiness and be effective intercessors. Adoration – As we engage in times of adoration and acknowledgment of God, He will direct our paths and direct our thoughts and attention to those things nearest His heart. Thanksgiving – A heart of gratitude will enable us to recognize that He controls all things and that He is working everything according to His purposes. Edification – God will edify His people as we seek first His kingdom and His righteousness. He has promised to show Himself strong on our behalf as we have pure hearts before Him. Repentance – As we receive God’s Word, confess and repent of our sins, He will forgive our sins and cleanse us from all unrighteousness and renew our hearts. Last year, $450 billion was spent on Christmas in the United States. $11.4 billion would bring a sustainable clean drinking water source to every person on the planet. This isn’t a fundraiser. It’s not a guilt trip. Advent Conspiracy, like Water Brings Life, doesn’t collect any money for their own use. Their dream is this. What if the people who celebrate Christmas decided to give one less gift this year for Christmas? And, what if more of the gifts that were given were relationship building rather than just objects that will collect dust and contribute to family debt? For example, what about a family exchanging hand made gifts? Or, what about giving games to each person that everyone can play on a family fun night each week? What if friends made dinners for each other? Or took each other to the zoo or a museum for a day to spend together? You get the idea. Then, what if each person took the money they would have spent on that one gift, and they gave it to a good cause? Last year, Advent Conspiracy asked that 25% of the money each church raised during the “Give More” offering be donated to a water aid organization. They specifically recommended Living Water International…but the decision was left up to the specific church/family/etc. The movement raised over $500K. You can read about the wells that have been built here. The concept is simple. Worship Fully, Spend Less, Give More, Love All. My church is on board for this. What about yours? If you talk to your pastors/elders/whomever, would you comment here? We’d love to know. And, if you need information, let us know. We can get that for you, too! 1. Does your organization test water quality? 2. How does your organization address the “sustainability” of the water wells? 3. How does your organization involve local communities in its water well projects? 4. Does your organization pair sanitation facilities (i.e., latrines) and hygiene education with the provision of clean water? 5. Does your organization work with community leadership to form “water committees”? Check out his article here. It’s good stuff. Continuing with our series highlighting some of the drinking water aid organizations…let me introduce Thirst No More. Their mission is to complete “compassion projects” to relieve suffering around the world. They are one of the few water aid organizations that has been allowed to work in Sudan. They also allow directed giving. That means if you want to focus your giving on disaster relief or supporting workers in the field or well repairs, etc., you can do that directly on their site. However you want your funds to be used to bring clean drinking water to those who need it…chances are they can help you do that. On a personal note, Dr. Damron was very helpful in getting me information about their organization and was willing to meet with me while he was on a personal trip to North Carolina. (Unfortunately, having 2 small children, my schedule got crazy and I wasn’t able to meet with him.) Seriously, check these guys out. They do fantastic work. Can you get to our blog? Lost the blog page? Click here!